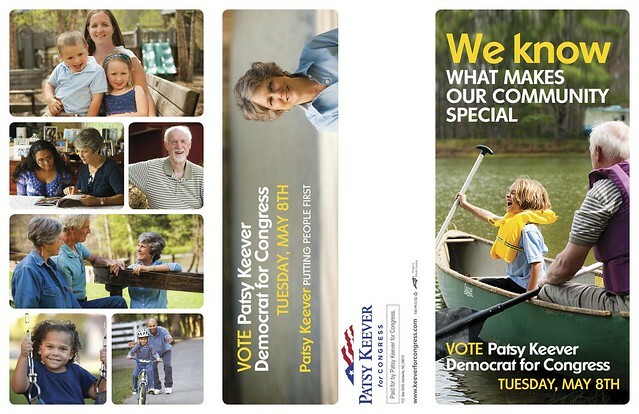 This image was taken from one of Patsy Keever’s mailers, which were a key part of her successful campaign. 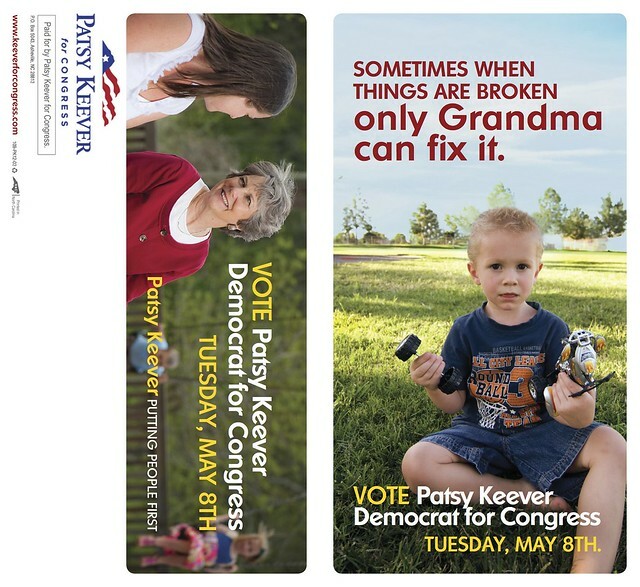 See below for images of all of Keever and Bellamy’s mailers. A look behind the scenes of Rep. 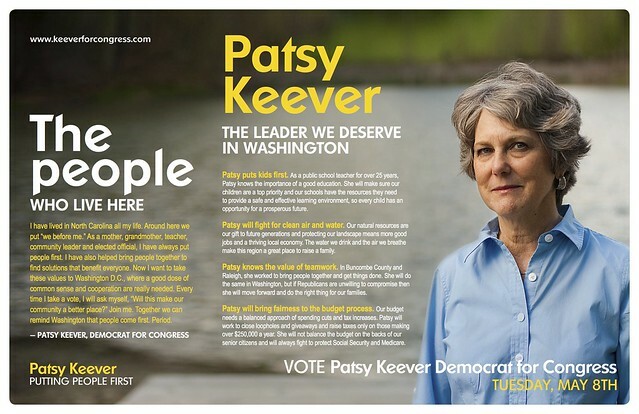 Patsy Keever’s successful Democratic primary campaign in the 10th Congressional District sheds new light on how she was able to triumph over her main rival, Asheville Mayor Terry Bellamy. Despite Bellamy’s head start and fundraising advantages (which led some commenters to dub her “the frontrunner”), Keever garnered 58 percent of the vote to Bellamy’s 27 percent. Rutherfordton resident and political newcomer Timothy Murphy received almost 16 percent of the total. Keever’s margin was even bigger in her home turf of Buncombe County, where she got about 67 percent of the vote to Bellamy’s 28 percent and Murphy’s 5 percent. Among some observers, the results have raised doubts over Bellamy’s political career. 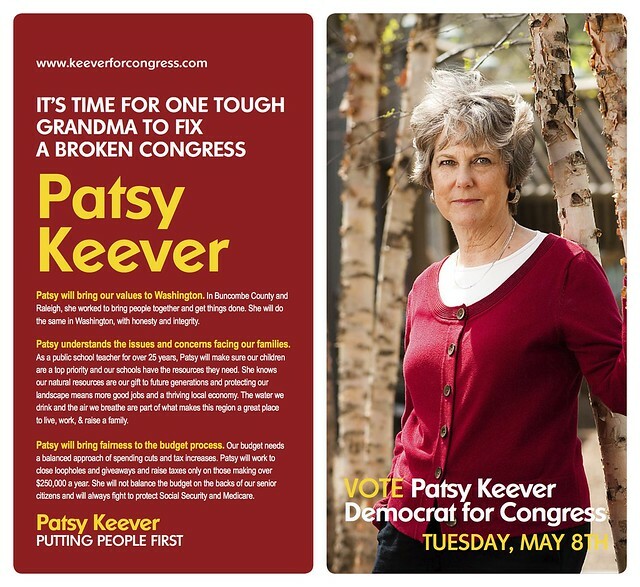 Meanwhile, the Keever campaign credits the strength of its candidate, as well as smart strategy – two things it’s eager to highlight as it gears up to try to unseat powerful Republican incumbent Patrick McHenry in the fall. According to an internal Keever campaign memo that was recently shared with Xpress, her campaign commissioned a poll in February that provided essential data about the newly formed district and how best to proceed. Before the campaign even kicked into gear, the team learned from polling information that Keever led Bellamy by more than 2 to 1 in Buncombe County and that she would likely get a minimum of 55 to 60 percent of the primary vote here. The poll also showed that both candidates were relatively unknown in the other counties in the district, which was redrawn last year to include most of Asheville for the first time. That allowed the campaign to focus all of its resources on reaching out to other parts of the district, which stretches southeast from Asheville all the way to Gaston County. Meanwhile, Bellamy had to spend valuable campaign resources on trying to rally voters closer to home. According to the memo, polling also found that, although primary voters were concerned about jobs and the economy, they also wanted a candidate who was committed to quality education, protecting natural resources, a spirit of cooperation, and balancing the federal budget by closing loopholes and raising taxes only on those making over $250,000 a year — not by cutting Social Security or Medicare. 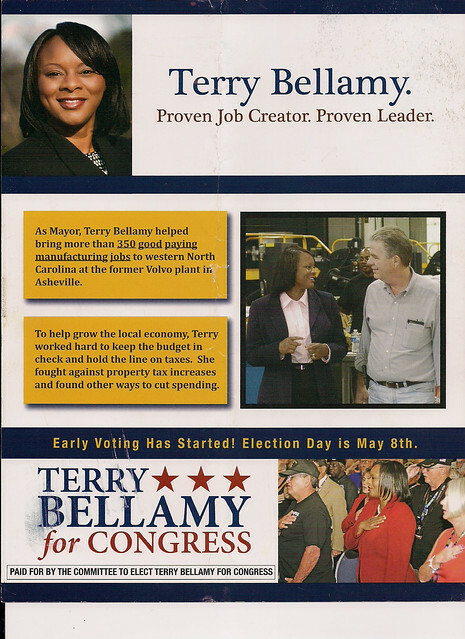 While the Bellamy campaign focused almost exclusively on an economic message, Keever interwove those additional themes into her campaign message and materials. She also pushed back on the alleged “Republican War on Women” that was making national headlines, garnering more than 800 signatures on a petition calling for its halt in just a few days, according to the memo. Keever relied on inexpensive grass-roots efforts such as letter-writing campaigns, email newsletter outreach and radio interviews to rally her base of support in Buncombe County. In the rest of the district, however, her campaign waged an aggressive and targeted effort — particularly with direct mailings — sending out two postcards to more than 20,000 voters who had a history of voting in primaries. In addition, the campaign commissioned a robo call and volunteers made 6,000 personal calls to likely voters across the district. Keever also held a “telephone town hall” with 3,500 participating voters. And in the final 10 days of the campaign, likely Democratic primary voters in Gaston, Shelby, Catawba, Lincoln, Rutherford and Polk counties were contacted at least five times, according to the memo. Meanwhile, the Bellamy campaign seems to have spent a lot of money on less targeted efforts such as radio and television advertising that reaches a lot of people who don’t tend to vote in Democratic primaries. The Keever campaign also credits the leadership of manager Jon Bray, who – despite being in his late 20s – came to the area from Washington, D.C., with extensive experience working at campaigns across the country. 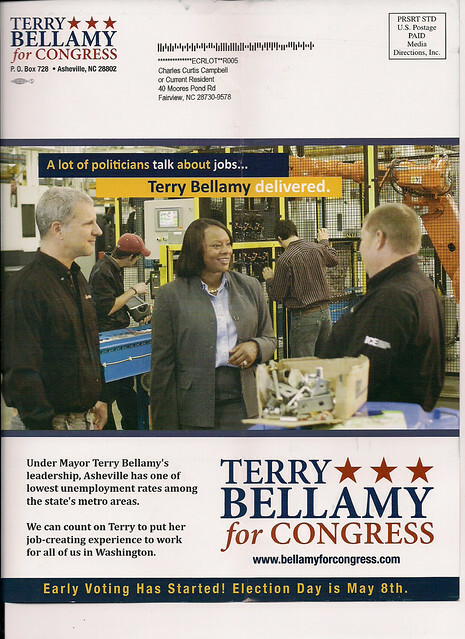 In contrast, Bellamy’s campaign was managed by Kendra Turner, who was new to professional politics and had previously worked as a community relations specialist for the city of Asheville. Ongoing campaign polling showed that its efforts were helping move the numbers in their favor. Since the baseline poll in February, Patsy’s support grew from 31 percent to 58 percent in the district as a whole — a 27 percentage point increase — while Bellamy’s support grew 14 points and Murphy’s by 9 points, according to another memo released from the campaign that was written by its polling firm, Lincoln Park Strategies. In the Charlotte media market, her rise was “meteoric,” going from a “largely unknown figure with only 12 percent of the vote to obtaining 51 percent of the vote: a 39 percentage point increase,” according to the memo. However, the memo laments the fact that no exit polling was done, which would have potentially provided a clearer picture of what happened and where the campaign should go. “Without exit polling, we will never know what voting blocs came out strongest for Patsy and which tended to support Bellamy,” it reads. An analysis provided to the campaign (and shared with Xpress) by George Peery, Professor Emeritus, Mars Hill College, notes that the newly drawn 10th District is friendlier territory for Democrats than it was previously, although the numbers still favor Republicans. The new district, Peery adds, is “so constituted that almost half the voters in it are new to the district.” And according to the Lincoln Park memo, that means that although “McHenry will have the advantage of a more friendly terrain and more funding,” he will “also be largely unknown” to many voters in the district. The photo shoot was on a windy day.